Why You Should Not Free Download HandBrake for Windows 10? HandBrake makes the list of top ranked free and more accurately open-source video transcoders in global market, especially, in U.S and Japan. Many people were accustomed to using HandBrake to rip home DVDs on Windows 7 and 8.1 PC (32 or 64 bit). Now that Microsoft Windows 10 OS overspreads, you may be stumped about the necessity of installing HandBrake on your Windows 10 device at hand. - I had Handbrake and it worked great until Microsoft in all their greatness put out Windows 10 and then nothing work's right anymore. - I've used Handbrake for years and it began to stop encoding fully after my recent OS upgrade to Windows 10. So, before you get on board with HandBrake Windows 10 for DVD backup, please try another free DVD ripper as the worry-free HandBrake alternative. * Convert DVDs to MP4, WMV, FLV, MOV, MPEG, H.264, etc. * Rip DVDs to iPhone, Android, Samsung, and so on for convenient playback. * Hyper-threading and Super Encode Engine based on MMX- SSE & 3DNow together deliver a fast conversion. The most common complains about Handbrake not working errors are that HandBrake crashes or hangs while scanning DVD titles and won't rip a DVD completely. When I click on the source of the DVD I get an error saying 'no titles found. Please make sure you have selected a valid non copy protected source'. What am I doing wrong? There may be too many reasons for HandBrake No Valid Source Found Error: the input source file format may be not supported by HandBrake; your DVD source may be copy protected. How to solve the problem that VLC cannot find Handbrake 64 bit? Get the best HandBrake alternative to rip regular and encrypted DVDs at ease. Reportedly, if you have some DVDs that cannot use Handbrake to get it 100% converted, this DVD is mostly encrypted with DVD copy-protections. Generally, HandBrake really does not crash before finish conversion, it just isn't displaying the last step(s) it needs to finish before the conversion is complete. If you are a Handbrake user, you may use Handbrake to convert DVD or Video files, but sometimes the output video and audio is out of sync. Besides the HandBrake Windows 10 problems, HandBrake saves DVD as M4V not MP4 file, which causes inconvenience to users who want to play the videos with more devices. But the best HandBrake alternative - WinX DVD Ripper Platinum that has been optimized for Windows 10 especially lets you throw all such worries. For the HandBrake Windows (10) alternative, you need look no further than WinX DVD Ripper Platinum, which can defeat almost 80% of the similar DVD backup software and apps in the market. There lies a boatload of reasons for it to be the best DVD ripper for Windows 10. 1. DVDs support: the Windows 10 DVD rip software takes the place of HandBrake mainly in the aspect of removing DVD copy protections without the need of downloading and installing Handbrake Windows 10 libdvdcss. It supports the personal backup of movie DVDs with Sony ARccOS, Disney X-project DRM, CSS, UOPs, APS, or discs having region codes, RCEs, etc, let alone the homemade DVDs. Moreover, it can rip DVD ISO image file and VIDEO_TS folder. 2. Fast speed: a magic weapon of WinX DVD Ripper is the speed it delivers in DVD conversion. Level-3 hardware acceleration makes full use of GPUs (Intel, NVIDIA, AMD) to reach an ultra fast encoding, decoding and processing speed. In addition to the multithreading tech and Super Encode Engine it applies, it allows you to utilize "CPU Core Use" (up to 8 cores). According to tests, it only took less than of a half hour to back up a feature-length movie (to MPEG2 file in DVD copy mode). 3. 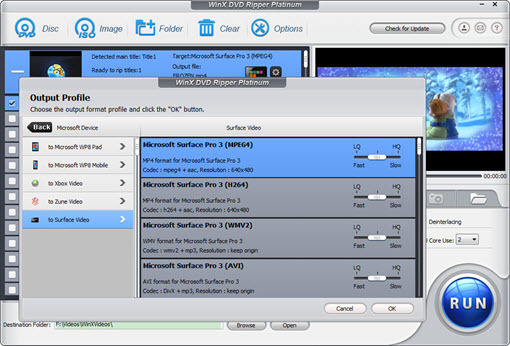 Vivid output: the output formats provided by WinX DVD Ripper Platinum include the mainstream video formats like DVD to AVI, MP4, MTS, MOV, WMV, MPEG and FLV. Superior to HandBrake, it also has 350+ preloaded profiles that facilitate DVD movie playback on all types of Apple, Android and Windows devices, such as iPhone 6S, iPad Air, Samsung Galaxy S6, HTC One, Xbox One, PS4, WP8, Surface Pro 3, Kindle Fire and Chromecast. 4. User friendliness: Unlike HandBrake which requires more highly on "know-how" of video codecs and parameter settings, the DVD ripping software developed by WinXDVD is easy to use. You don't have to daddle about the forums for distressing questions. Even the beginners can get the hang of it quickly with or without referring to the User Guide. The following guide will show you how to rip a DVD after downloading the HandBrake Alterntive for Win 10. Please first close HandBrake or other similar DVD and video transcoding or decrypting programs. Install and launch WinX DVD Ripper Platinum on Windows OS. Step 1: Add a DVD source to the HandBrake Windows 10 alternative. Insert a DVD disc into your DVD-ROM, click DVD Disc and select the source disc. If you have an ISO image file or DVD folder on your hard drive, you can add it through ISO Image or +Folder button. The main title will be auto checked. If it is not the desired one, please correct it by yourself. On the Output Profile window, choose the output format you need. If you need a Windows 10 compatible digital file, please scroll down and find PC General Video, such as MP4, AVI, WMV, AVC and MPEG. If you need to play back the movies on portable devices, please choose the corresponding profile in Microsoft Device, Apple Device, Android Pad, Sony Device, or the like under Device Profile item. You can find specific profiles of, for example, Huawei Mate 10, Surface Pro 4, Xbox One, iPad Pro, iPhone Xs/Xs Max, Apple TV, Nokia Lumia and BlackBerry. Step 3: Start decrypting and converting the DVD. Before hitting RUN button to let the HandBrake alternative kick over, you can choose to change the destination folder and make some settings on parameters. It won't take long to finish the whole process. What is libdvdcss? How to download libdvdcss.dll Windows 10 or install libdvdcss.pkg Mac for HandBrake to decrypt movie DVD?